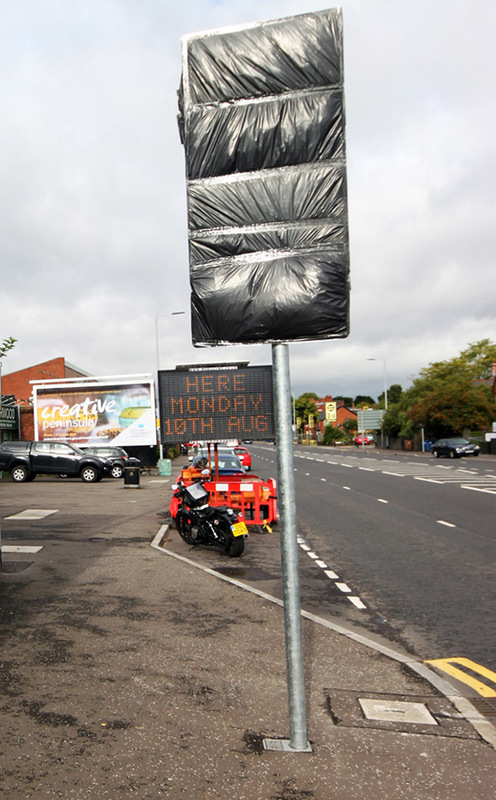 New Bus Lanes are to be introduced in Belfast on the Upper Newtownards Road in Belfast on Monday 10th August 2015. 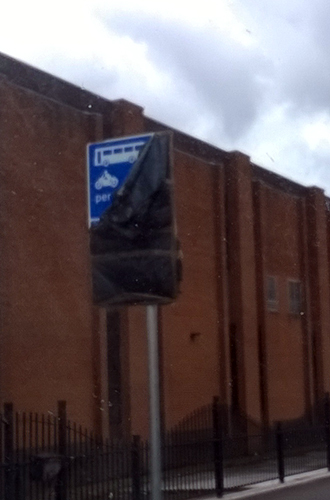 While out and about we pictured the signs in place ready to reveal the Bus Lane use and which vehicles will be permitted to use them. One rider commented on our Facebook page, “Can’t you shake the sign and try and figure out what’s inside?” So we went and had a look to see if all could be revealed. “The Bus Lanes (Upper Newtownards Road, Belfast –between Sandown Road andKnock Road) Order (Northern Ireland) 2015”, (S.R. 2015 No.297), which comes into operation on 27th July 2015. 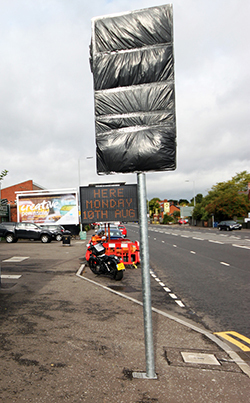 The rule provides for with-flow bus lanes on lengths of Upper Newtownards Road, Belfast (between Sandown Road and Knock Road) during the hours 7.30 a.m. to 9.30 a.m. and 3.30 p.m. to 6.30 p. m. Monday to Friday in which cycles, motorcycles and permitted taxis will be allowed. 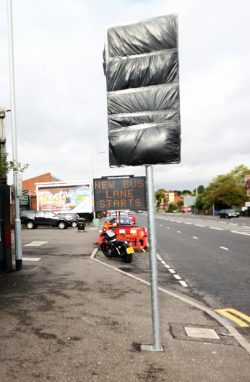 So good news for motorcyclists and riders of scooters and mopeds, for another Bus Lane that permits the use of motorcycles, Scooters and Mopeds, although others are not so happy, as the Bus Lanes are now enforced with either static or mobile enforcement cameras with a £90 fixed penalty fine, cut to £45 if paid within 14 days, for non-permitted vehicles. The Ukip MLA added: “It’s bad enough having to drive through Belfast without having to worry about cameras and fines. In our closeted world of motorcycles and two wheels do we really or you give two flying “red bricks” about fines and four wheeled traffic management, as we tootle down through the traffic congestion? It wasn’t us but motorcycles revealed on the new bus lane access on the Newtownards Road!